Just when it looked like the bubble might be cracking, that venture capital investment in education was stuck in the doldrums, and that the year in EdTech might end with a whimper, no bang in sight, along comes Knewton to put an exclamation point on an active December. In a whopping round that stands as the fifth largest venture investment for an education company in 2013, TechCrunch has learned that the New York City-based EdTech veteran has just closed a $51 million financing, led by London venture firm, Atomico. The round also sees GSV Capital join as a first-time investor, along with participation from existing backers, including Accel Partners, Bessemer Venture Partners, First Round Capital, FirstMark Capital and Founders Fund, along with debt financing from Silicon Valley Bank. With the new round doubling its total capital to $104 million, Knewton has big expansion plans on the docket, chief of which is its plan to become a global business. In October, the startup opened an office in London, its first office outside the U.S., which COO David Liu says will serve as the headquarters for its international operations as it looks to continue expanding across Latin America, Asia and the Middle East. Over the coming year, the company also plans to add 80 to 100 people to its staff of 145 — with a heavy focus on beefing up its data science and engineering teams — and move into new, larger headquarters in NYC. Since debuting in 2008, Knewton has been on a mission to democratize top-tier, personalized education around the world. While that may sound like unrealistic fluff, over the years, the company has slowly pieced together software, infrastructure, APIs and gathered vast, anonymized data sets, which have since become the foundation of its innovative adaptive learning engine. 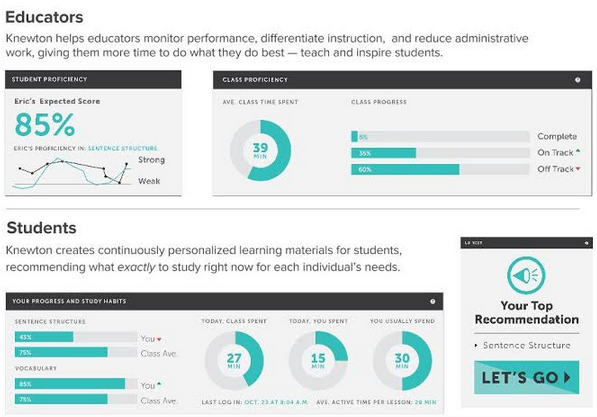 In practice, Knewton’s analytics engine is able to map each student’s strengths and weaknesses over time, which then both enables teachers to identify and predict knowledge gaps and personalize instruction and tailored content to each student’s individual learning path. While that may sound like the building blocks of a consumer platform, Knewton has instead opted to become a service provider, giving educational publishers the adaptive infrastructure which allows them to not only bring reservoirs of content online, but to make that content smarter — and more personalized. Because so many publishers have struggled to adapt to an increasingly digital world, by acting as a technology provider, Knewton looks to be in an increasingly advantageous position. Over the past year, Liu tells us, the company has generated close to two billion personalized recommendations for students. And it’s been able to do that thanks to partnerships that now span most of the major education publishers in the U.S., including Houghton Mifflin Harcourt, Macmillan Education, Triumph Learning and Cambridge University Press, among others. These partnerships have allowed the company to triple its revenue in 2013, the COO said, and with Houghton Mifflin now on board, Knewton’s technology is now being used by over five million students in the U.S. But, perhaps more importantly considering Knewton has traditionally served higher ed partners, Houghton Mifflin and Triumph Learning are now beginning to give Knewton real penetration into the K-12 market. While it’s still relatively early days, the other potentially interesting area of opportunity for Knewton comes not from the old publishing world, but the increasing number of EdTech platforms and new learning models that have begun to sprout over the last two years. Given the difficulty startups have traditionally had surviving in K-12, thanks to slow sales cycles and bureaucratic decision-making that happens at the district level, many startups have opted to sell to teachers or parents instead. Many are focused on the distribution side, Liu says, with MOOCs having become of the more prominent examples of the new, digital distribution models now taking off within education. With Knewton attempting to serve the other side of the coin — particularly the data mining side — these new digital education platforms, MOOC and not, could ultimately become Knewton customers as well. Whether it’s the Pearsons and Harcourts of the world or the Courseras and Udacitys, their core competency is in delivering great content. They, to varying degrees, understand user interface, Liu tells us, and Knewton wants to be the infrastructure that powers that user interface. Increasingly, as MOOC platforms continue to beef up their content libraries and course catalogs, they will begin turning their attention to personalizing the student experience. They don’t seem to be there quite yet, but when they do, Knewton wants to be there. While you may not find too many startups or entrepreneurs itching to jump into the publishing world — let alone educational publishing — Knewton believes that by becoming the adaptive PaaS provider that helps publishers inject technology and personalization into their content, there could be plenty of greenfield ahead. And the greenfield that Knewton’s paying most attention to? It’s not in the U.S., Liu says. Many developing countries aren’t bogged down by the same legacy infrastructure one finds in the U.S., which means that their governments, states and schools are in a position to jump from first gear to fifth gear. Naturally, Knewton thinks that spells big opportunity for adaptive technology and Big Data companies.